ruminate about the question. blink, and within milliseconds, fireworks explode inside of your heart when it registers to you. ribbons fly behind your eyelids. an unexpected giggle escapes from your mouth. if only they knew what it was like to conquer the fear of living. “pretty good, actually, for once in my life.” give a modest smile back. you don’t think they believe you. die. you imagine a withering flower. you feel the heaviness of the word in your throat, but it blankets you like fog and disperses. death is a nebulous place that does not seem to fit you anymore. it used to be a mansion you wanted to reside in. death seems so far away now though. the line between ‘life’ and ‘death’, which used to be more or less the same thing in your eyes, has grown so far apart. death seems like perfect closure, but it isn’t time for that yet. you haven’t done what you were meant to do in this place yet. you trace a finger around the rim of your wine glass. it produces a beautiful hum, and you feel your soul murmur contently in response. you remember the same question being asked to you two years ago. you remember you sitting in the same chair, with your shadow boiling angrily on the ground, trying to rise and take over. you defeatedly slumped your shoulders, fidgeted with your hands, looked down at the ground in search for an answer that wasn’t so sad. the bangs of your long black hair shield your eyes, creating deep shadows against your hollow face. the answer was somewhere in you, but it left you, escaped you, in the form of an exhale. you look back at your hands, they were supposed to be so strong. they build things. they pick things up. push you out into the world. you stare at them angrily because they were trembling. like the first waves of an earthquake, your trembling hands became your trembling body. your flesh, parts of the essence of you, fall off the cliffs of your slender shoulders like rocks and your shadow emerges more and more and more and the light of your eyes is less, less, less, falling deeper into the abyss of darkness. you tried to reason with yourself to them. you moved your stiff arms up and down like the eternal image of the scales. you were weighing helplessness in one hand, and solace in the other. but within seconds the arms fell down, balance collapsed, and you faced down once again, the opposite direction of the sky. presently, you realize that a ray of sunshine sits on your arm like a bird perched on a branch. your mind fast forwards to present again. you blink. that was two years ago. you laugh again, laugh at how silly it is, how easy it now, to bend from the past to the present, to happy. there was sun on your flesh. exposed to the light were your invisible scars. you stare at them long and hard, and your freckles, like dark black holes, are ones that your own tiny soldiers shoveled up to the brim with your flesh. you are repaired. the leaks have been fixed by your own strong will. instinctually, you put your hand over your heart. never have you felt your heart beating so loudly. it reverberates through your eyes, out of your ears. you can feel the waves of your heart beat traveling far, too, moving mountains, shaping hillsides, touching family and loved ones, building communities. you look down again at your hands. the two parts of your body that have helped you extend your soul to the world. you realize that your once trembling hands have become strong empowered fists, sanguine with passion and progression. your shadow is still there under you, bubbling on the ground. it’ll always be there. it was a stranger before, a bottomless black lagoon. after years of delving deep, it cannot penetrate you anymore. you laugh at the idea of even considering ending your life. of course not. you are too powerful. fresh chamomile blooms out of your eyes. 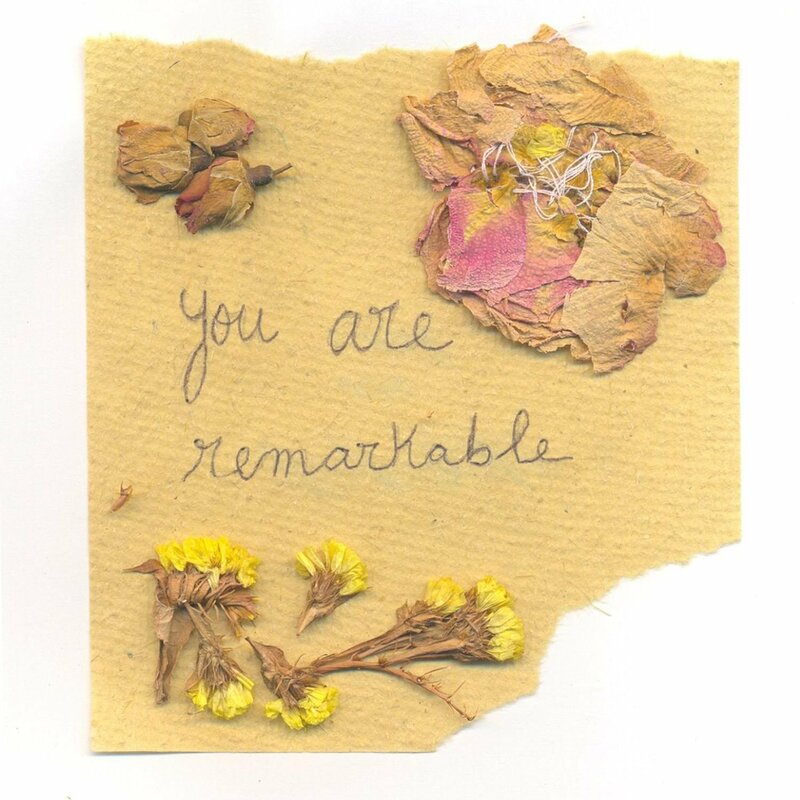 you are remarkableamy xu, guest. Wow. This blew me away, and as someone who has followed the same arc . . . wow. This evoked strong feelings in me. Both painful ones and healing ones.